PI103. 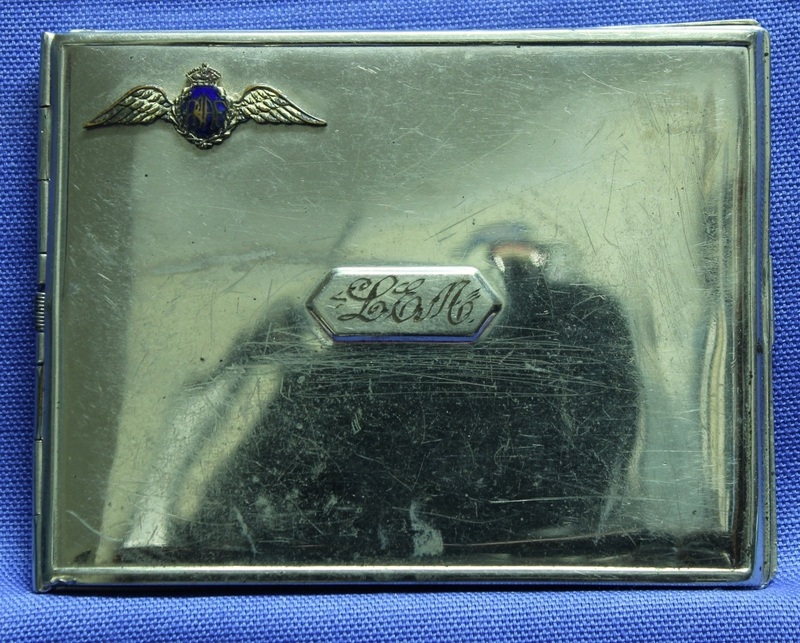 A chrome cigarette case engraved with the initials L E A and has a gilt and enamel pilots badge at the top left. 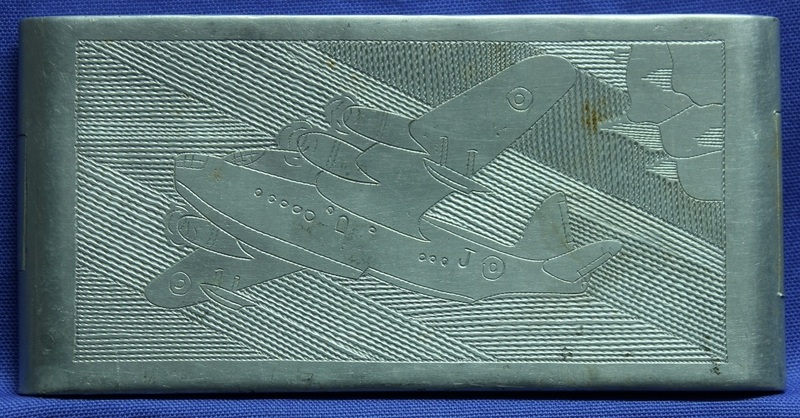 It is made by Barwyn Australian. PI107. 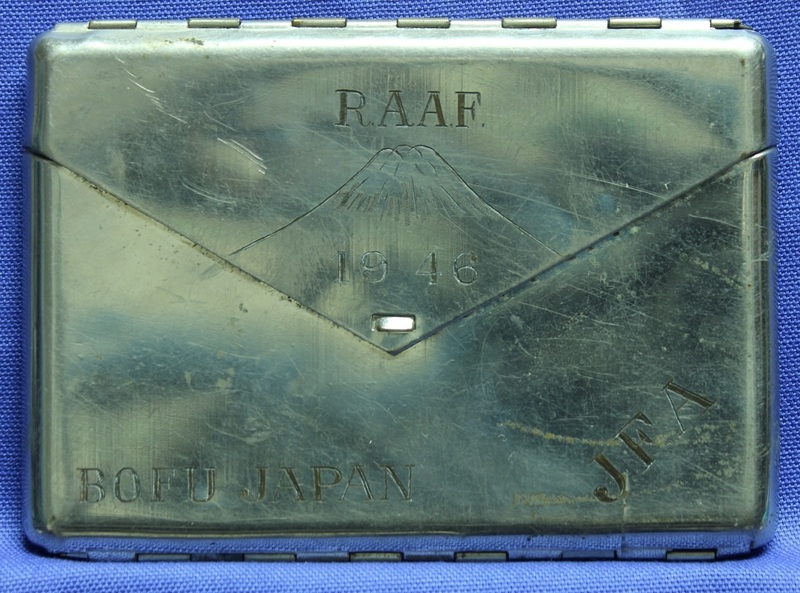 A chrome cigarette case engraved with RAAF over Mount Fujiyama, 1946 BOFU JAPAN J. F. A.
PI108. 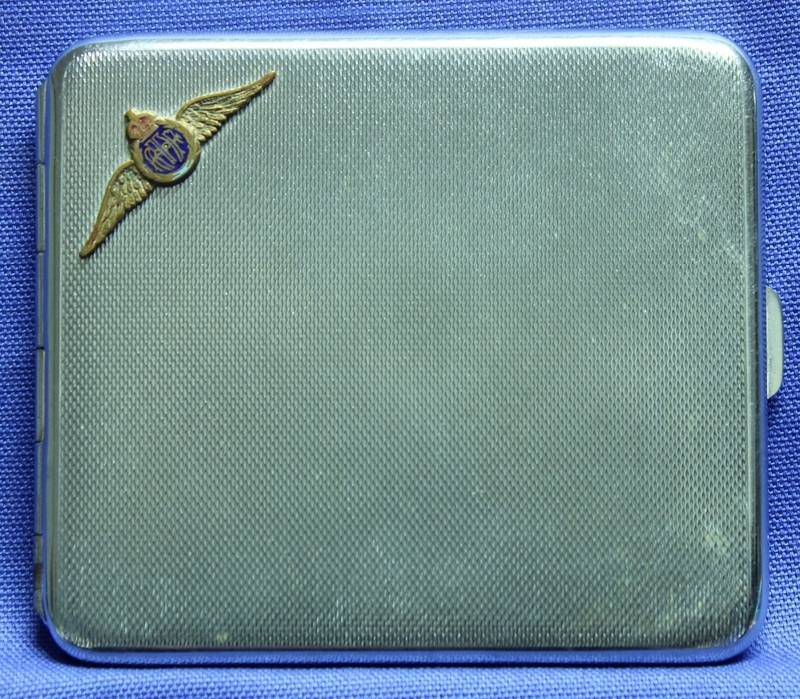 A square chrome cigarette case marked “Made in England Chrome Plate”, it has gilt and enamel pilots badge in the top left corner. PI116. 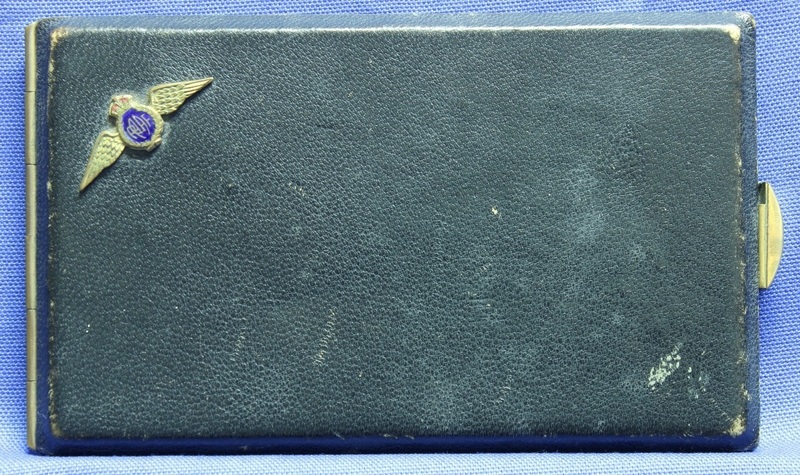 A rectangular gilt metal cigarette case covered with black leather and has a gilt and enamel pilots badge in the left top corner. PI139. 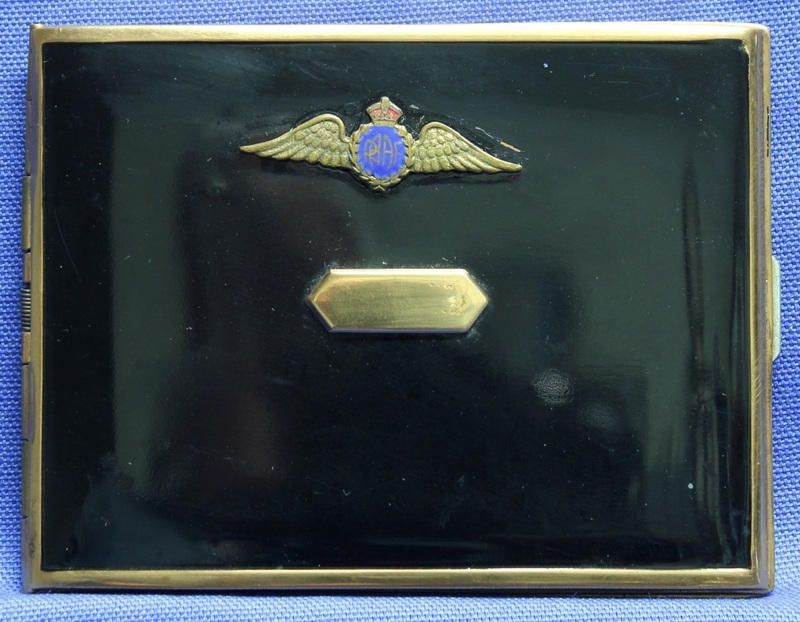 A black enamel and gilt cigarette case stamped “Barwyn Australian” with a gilt and enamel pilots badge at the top. PI171. 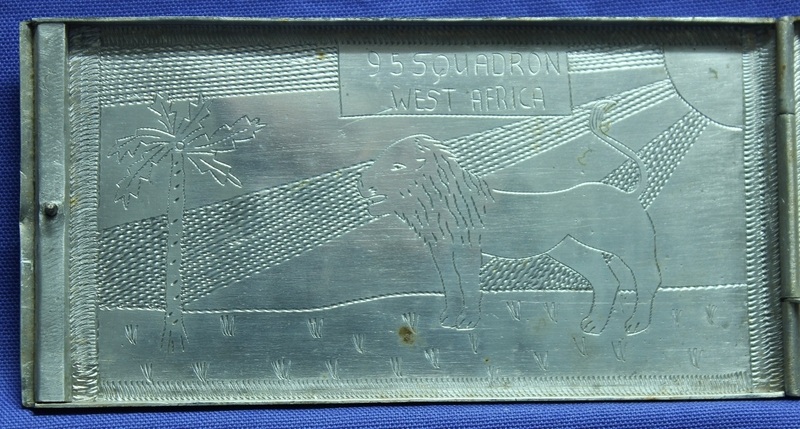 A rectangular aluminium cigarette case with a geometric design on the front with 423887 S K PRIESTLY RAAF and a signallers brevet, on the back is a Sunderland aircraft with the initial J on the side, inside left is a lion and palm tree with 95 SQUADRON WEST AFRICA and on the right is a young lady on the beach. PI174. 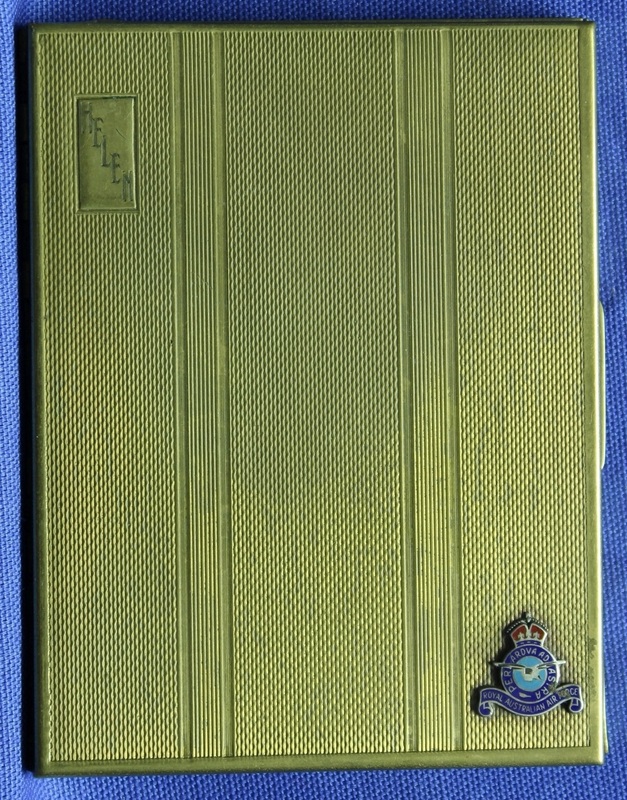 A blue enamel and gilt cigarette case stamped Barwyn Australian inside and has a gilt and enamel pilots badge at the top left. PI175. 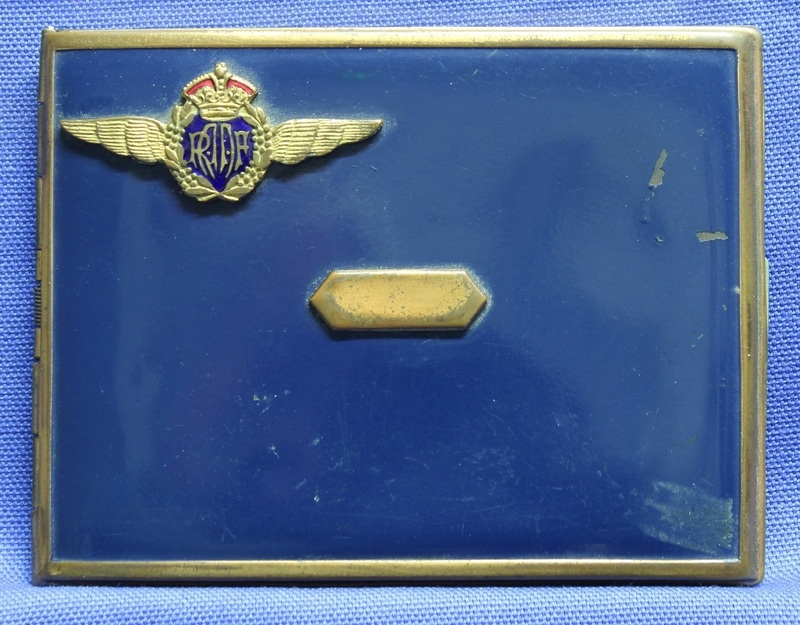 A rectangular gilt metal cigarette case covered with black leather and has a gilt and enamel pilots badge in the left top corner. PI189. 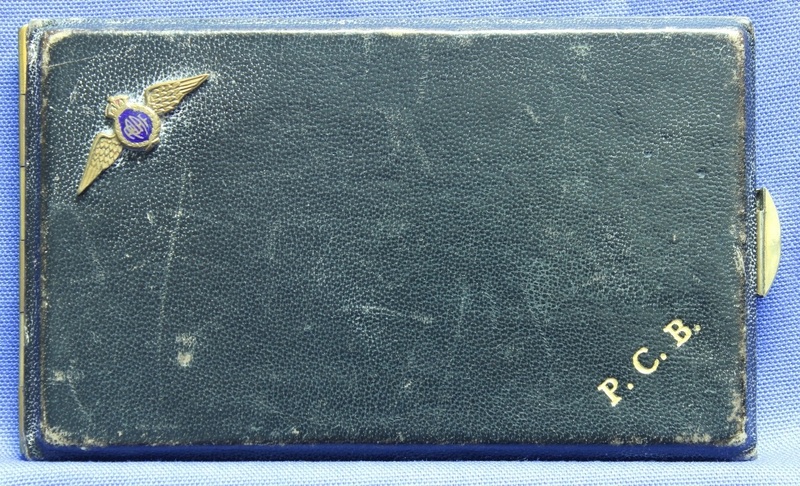 A rectangular gilt metal cigarette case covered with black leather and has a gilt and enamel pilots badge in the left top corner and gold embossed letters P. C. B. at the bottom right. PI190. 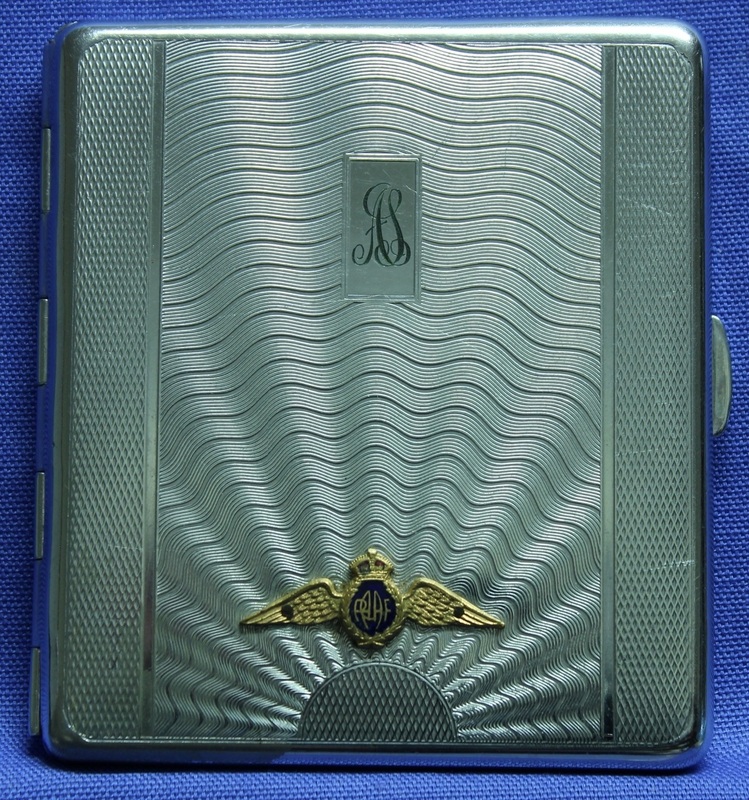 A square chrome cigarette case marked “Made in England” with a rising sun design and the initials A S engraved on the front, also a gilt and enamel pilots badge below. PI209. 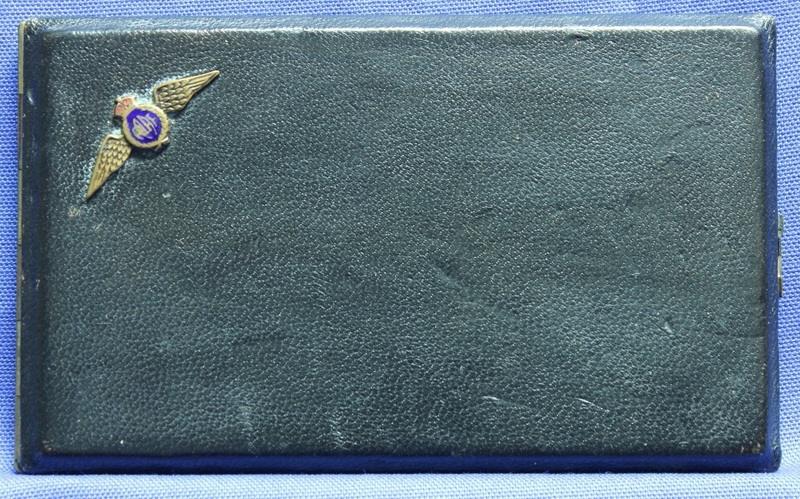 A rectangular gilt metal cigarette case covered with black leather and has a gilt and enamel pilots badge in the left top corner. PI211. 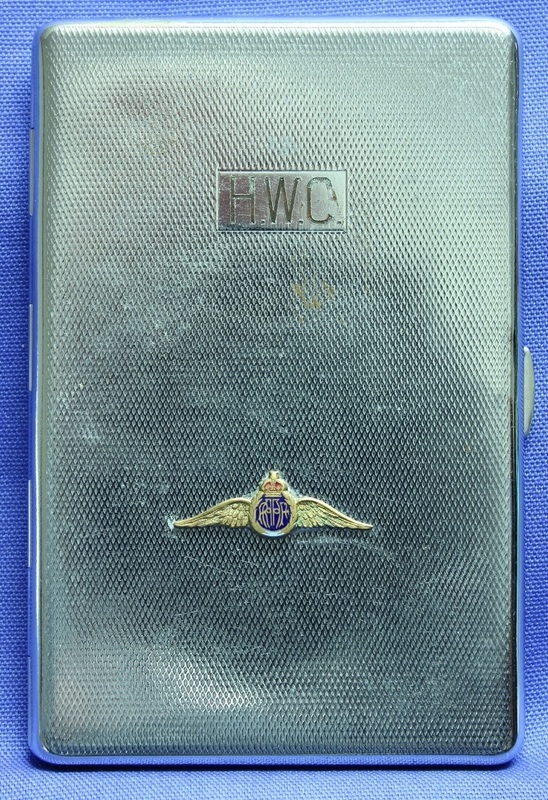 A rectangular chrome cigarette case “Sylva Chrome Emu Brand Made in England” with the initials H. W. C. and a gilt and enamel pilots badge on the front. PI217. 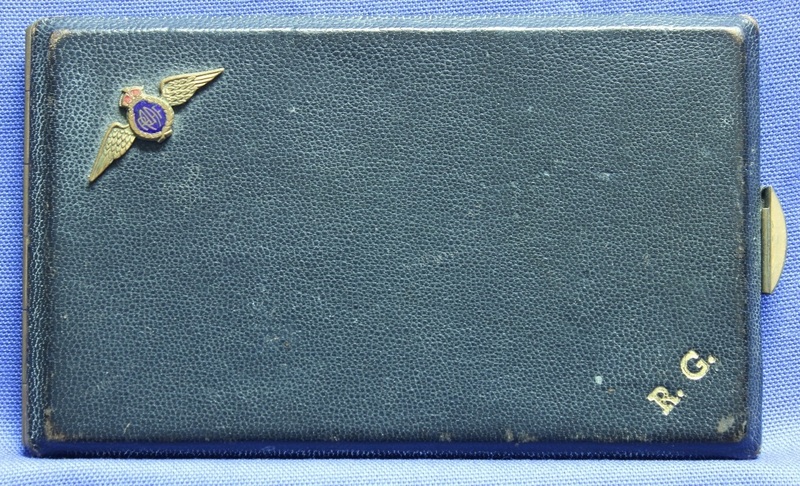 A rectangular gilt metal cigarette case covered with black leather with a gilt and enamel pilots badge in the left top corner. PI227. 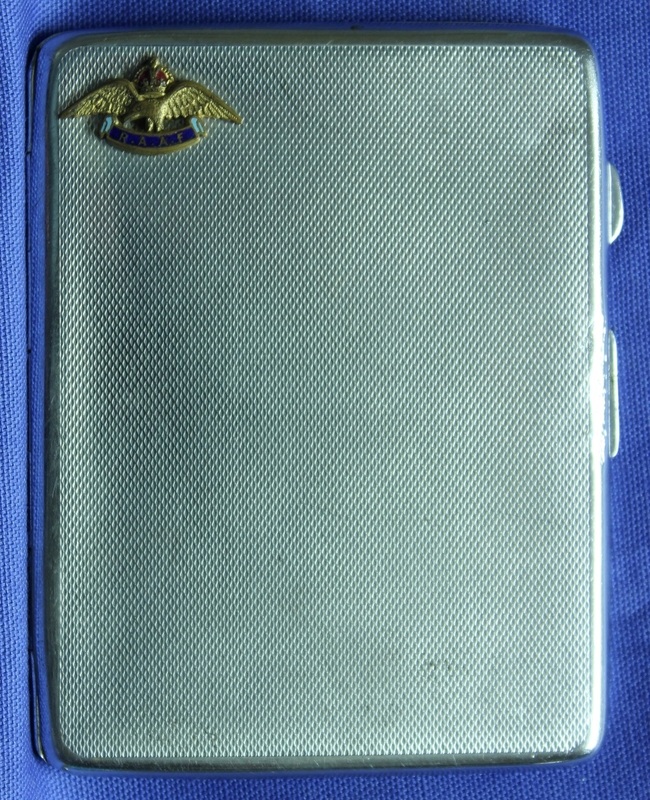 A gilt metal cigarette case marked Manhattan British Made inside with HELEN engraved on the front with a gilt and enamel RAAF badge on the lower right. PI247. 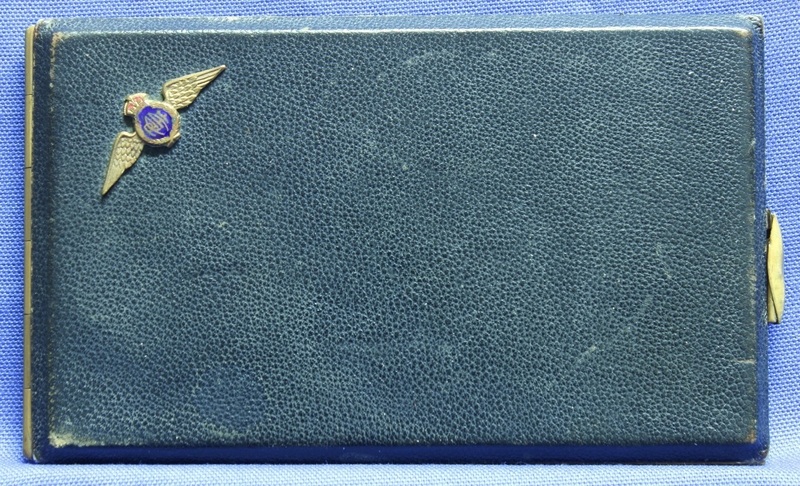 A chrome cigarette case stamped The Prince Dammans 53 inside and has a gilt and enamel eagle and RAAF on the top left. PI249. 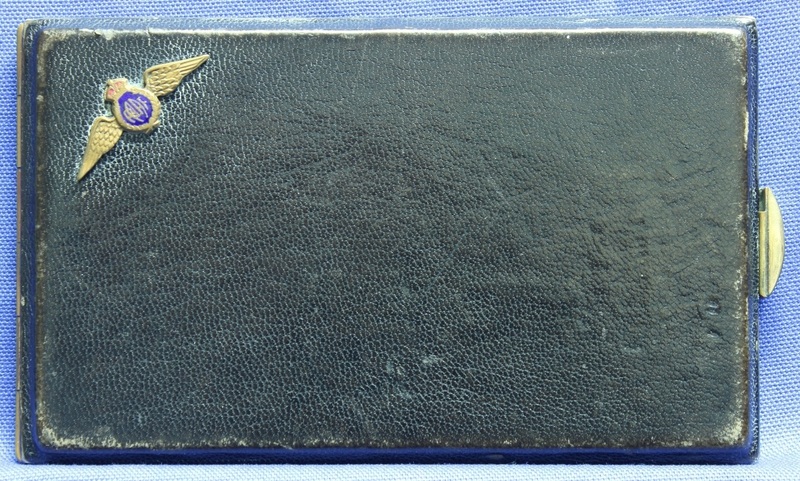 A rectangular gilt metal cigarette case covered with black leather and has a gilt and enamel pilots badge in the left top corner. PI259. 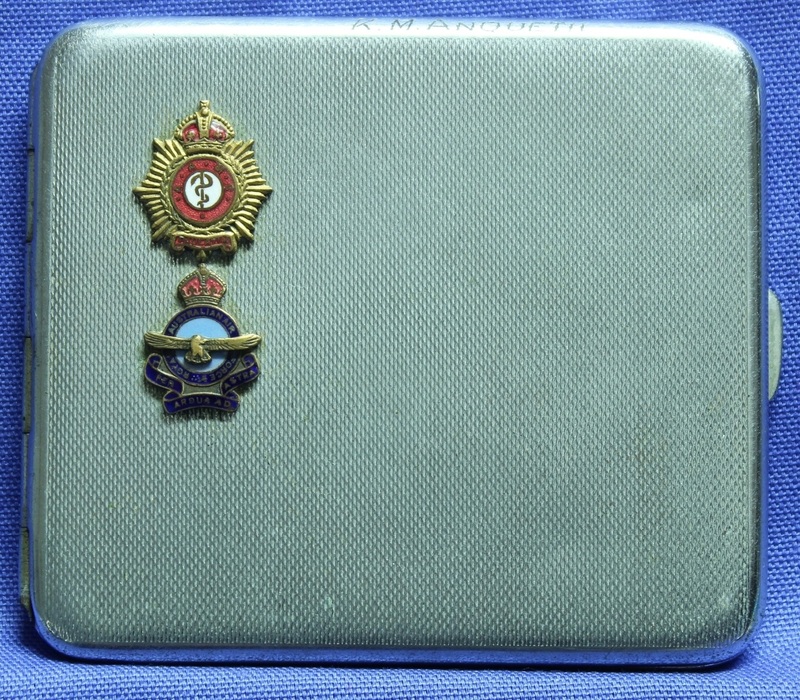 A square chrome cigarette case stamped “Made in England Chromium Plate” with a gilt and enamel Australian Army Medical Corps and a RAAF badge on the front. 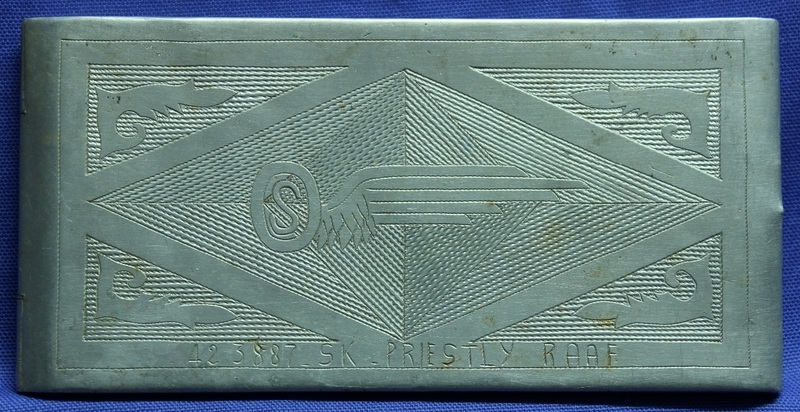 Engraved on the top edge is K. M. Anquetil. 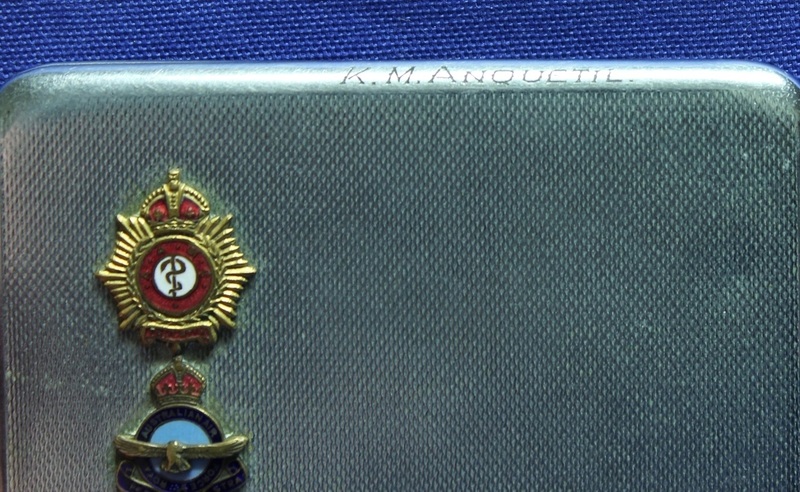 Kenneth Munro Anquetil enlisted on 12 Sep 1941 at Melbourne and discharged with the rank of Flight Lieutenant on 1 Jul 1947 from No 4 Communications Unit. PI259. 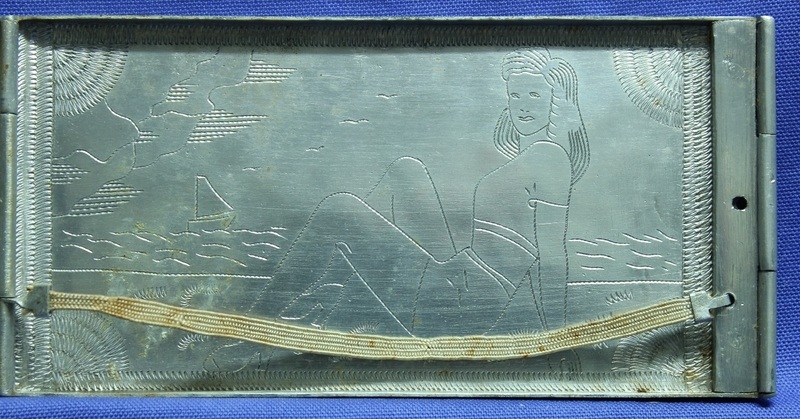 Engraving on side of case.